The Ross-Hindle Glacier enters Royal Bay on the east coast of South Georgia Island has now separated into the Ross and Hindle Glaciers. 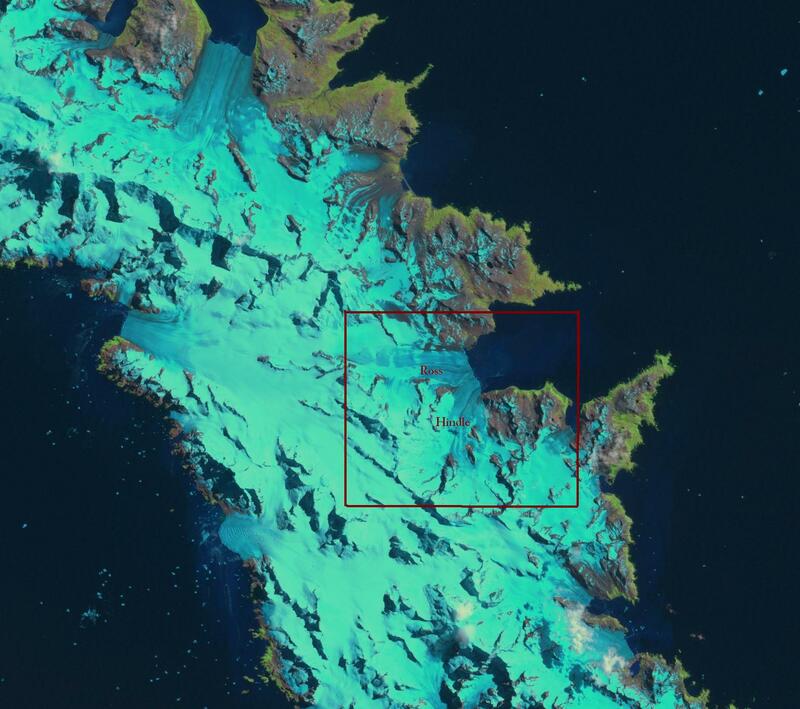 In a 2003 Landsat image the glaciers are joined, as they had been for quite some time. By 2008 the glaciers had separated. The tidewater glaciers of South Georgia in general maintained fairly advanced positions unitl 1980. Gordon et al., (2008) observed that larger tidewater and sea-calving valley and outlet glaciers generally remained in relatively advanced positions until the 1980s. For Ross-Hindle the retreat was minimal from 1960 to 1989. The change in glacier termini position have been documented by Alison Cook at British Antarctic Survey in a BAS retreat map The sequence of annotated Landsat images below indicates the retreat and separation from 2003 top, to 2008 and then 2010. Hindle Glacier front is noted with red arrow, Ross Glacier green arrow, V marks the location of the ridge at the beginning of their juncture. The retreat of Ross Glacier ranges from meters on the north shore to meters on the south side. The Hindle Glacier has retreated 1.5-2.1 km in this period. By 2008 the glaciers have separated, by 2010 a new bay has formed at the front of Hindle Glacier. 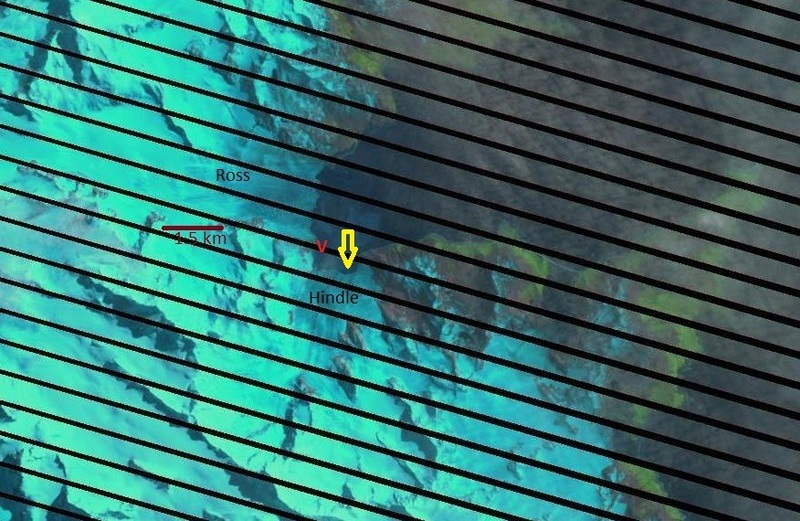 The new bay is evident, note yellow arrow. 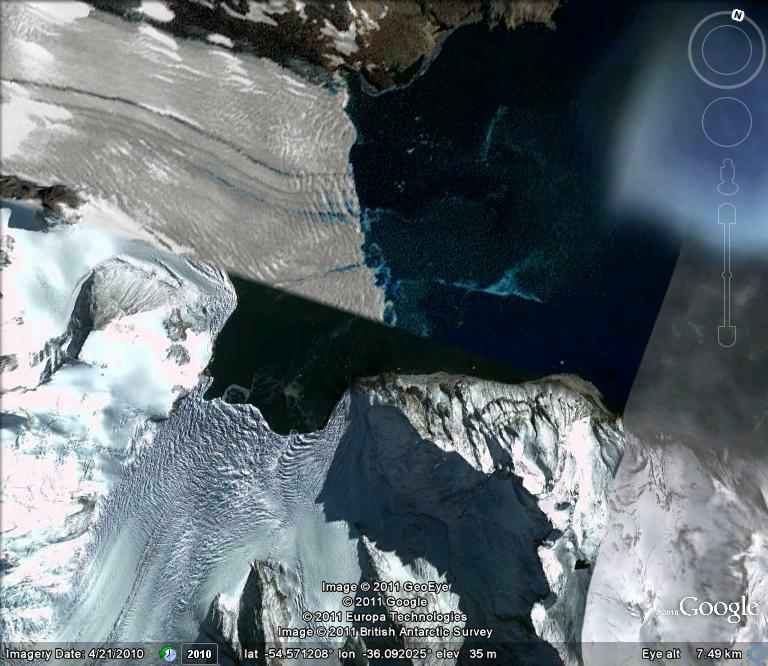 This leads to the strange juxtaposition in Google Earth of the 2003 image front for Ross Glacier and the 2010 image front for Hindle Glacier. 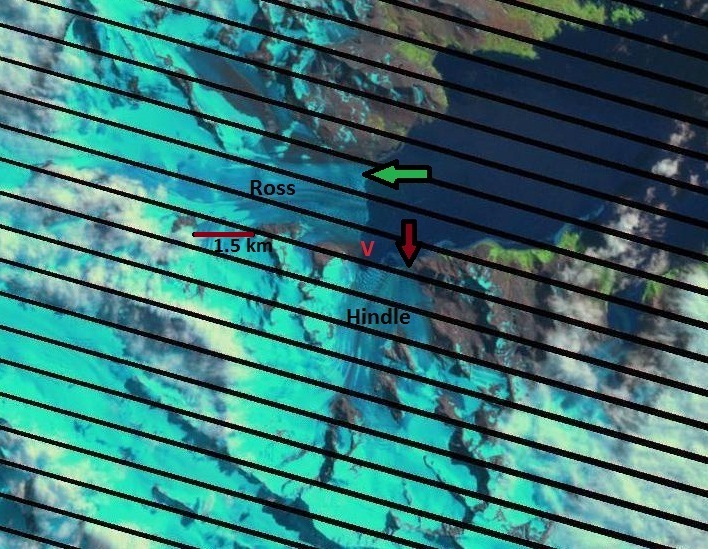 Further added crrevassing near the ice front indicates an acceleration of the Hindle Glacier. 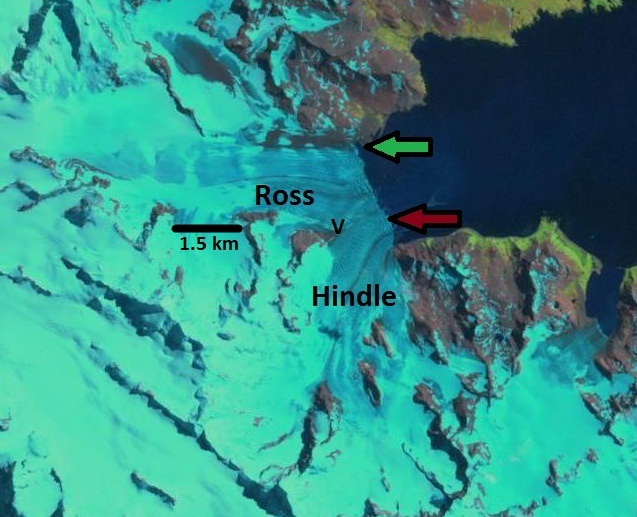 This suggests the Ross Glacier was impeding its flow previously and that Hindle is in a rapid retreat mode. 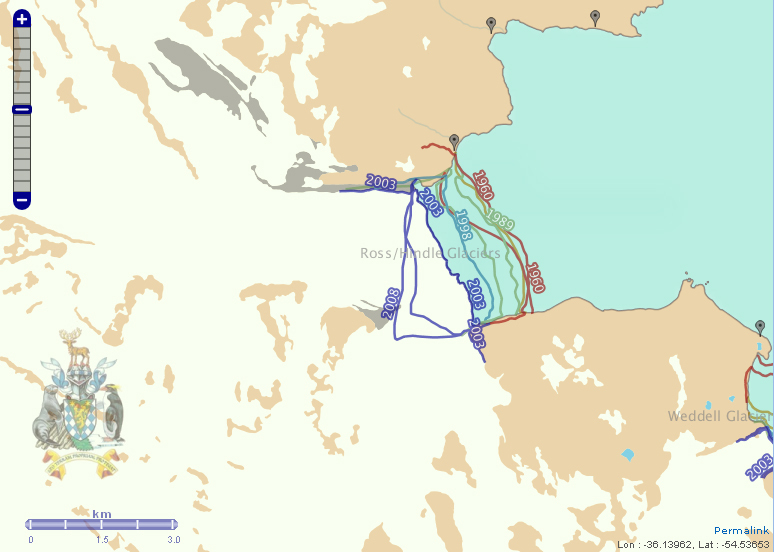 The rapid recent retreat parallels that of Neumayer Glacier further up the coast. The BAS research effort on glacier front retreat has been documented by Alison Cook . Her comparison of glacier fronts from old aerial photographs and comparing them with satellite images — she identified that 212 of the Peninsula’s 244 marine glaciers have retreated over the past 50 years and that rates of retreat are increasing. This entry was posted in Glacier Observations and tagged south georgia glacier retreat, south georgia glaciers, south georgia global warming. Bookmark the permalink.